OVER 100 participants set off from Dunsfold Park, home of BBC’s Top Gear, on 27 June for a 3,000 mile Rally for Heroes, which aims to raise £100,000 for the UK’s longest-serving military charity, SSAFA; the rally will end this Saturday 5 July. 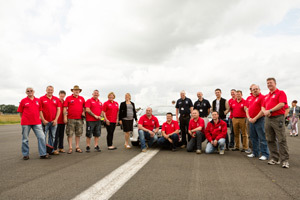 Benn Laidler, a serving soldier and co-founder of Rally for Heroes, said: “The Rally for Heroes organising team and the participants are all volunteers who are drawn to this event by the sheer excitement and adventure of a rally. TV presenter Vicki Butler-Henderson was the official flag waver at the start line; Eastenders actor Danny-Boy Hatchard who plays Army soldier Lee Carter, also attended to show his support. Every five miles of the rally is driven in honour of the 453 Servicemen and women who have died since the start of the conflict in Afghanistan, reflecting SSAFA’s role in offering support to families of those who have been killed or injured in recent conflicts. The track, which has been driven by endless stars and professionals alike, hosted over 50 cars before they set off on an eight-day driving challenge across eleven European countries, navigating some of the most demanding routes in the world. Joining the line-up was ex-Army paratrooper Jamie Hull, who suffered severe injuries whilst carrying out a routine solo training flight in America. Jamie spent over two years battling his injuries. 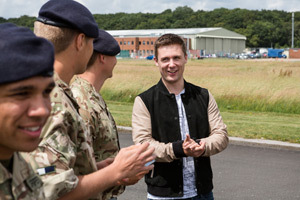 Throughout his recovery he and his mum, Shirley, were supported by SSAFA, so when the opportunity to take part in the rally came up, he didn’t have to think twice.